Want to know how unique products such as MyLifeOrganized are created? Who works on them? How the product is developed? These are the questions that founder and inspirer of MLO Andrey Tkachuk will answer, to help you learn more about MyLifeOrganized. 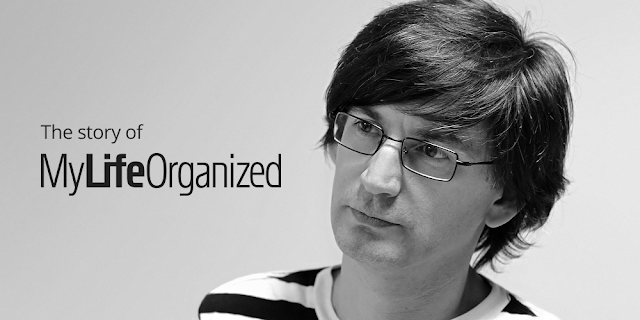 Andrey, Why did you decide to create MyLifeOrganized? This happened in the early 2000s. I was working in a fairly large IT company as a Program Manager, managing a large number of people and projects. At some point, I just felt the urgent need for a task management system, which would allow me not just to manage individual tasks but also entire projects. Ideally, it had to be possible to add subtasks. That was something that Outlook, for example, could not do. At first, I began to look for an existing system with this functionality. I tried many, but could not find the perfect one. So, eventually, I started to create such a program for myself, as I had plenty of programming experience. I called it MyLifeOrganized. I tried to combine the best that I had seen before with ideas from my personal experience. First, my boss got to see it, then some of my colleagues, and soon they also began to use it for their own planning purposes. That made me realise that I made a good product that many people would want. The main idea of the program was a hierarchical task list. There was virtually no equivalent at that time. Why did you choose the "Getting Things Done" methodology for the application? You wouldn’t believe, but when I wrote this app, I didn't even know of David Allen's "Getting Things Done". My colleagues, when they began to use the application, said: “You've got everything structured just the way it is in David Allen’s book." I wondered, who was David Allen? And then I read the book. The program had not been influenced by this book; it was just the most comfortable way for me to manage my tasks. And what happened after that, how were the MLO versions for mobile devices created? I work on the Windows version myself, while other developers in my team work on versions for mobile devices. First we developed a version for Windows Mobile, then for Blackberry and after that there was a version for the iPhone, which we created on the basis of the application code for Windows Mobile. For the second version for the iPhone we had to write from scratch, in order to remove all of the historical C++ code and use new technologies. It was a very difficult time; mobile technology was developing rapidly and we just did not have time to write for all the platforms at once. Plus, it was not clear which platforms would stay in the market and which would not. For example, we spent a lot of time and effort on a version for Blackberry, then it became clear that the Blackberry shares were going down and we had already used the resources. However, we were able to use MLO for Blackberry as the basis for developing the first version for the Android devices, because the Blackberry version was written in Java. Again, just like with the iPhone, we wrote the second version for Android from scratch, with new technologies. Luckily, this time we were able to effectively reuse the previous code from several independent modules. Tell us a little about the MLO team. Who is helping you to create the product? The MLO team is quite small, but they do an incredible job. The permanent staff consists of only four people. These are the developers working on all mobile MyLifeOrganized versions: 3 developers for Android and one for iOS. In addition, we have remote and part-time workers: a help desk operator, QA, designers, high-class specialists in the development and security of cloud-based synchronization. There are also the beta testers and they are an important part of the team, although they do not work in it directly. I will say a few words about them - We have a user forum and the most active participants receive access to the pre-release parts and become beta testers of the application. Before the release of a new version of MLO they get a beta version and test it with their tasks and projects. We do not motivate them financially, these are the people who are fans of the product and just want to help make it better. I always listen to their advice first. There are many such people in our community and I always say that we are very lucky to have them. It is unlikely that something else would test the strength of the product as well as a person and their live data. For me, the quality and convenience of the application is also very important - I am an active user of MyLifeOrganized myself and I manage about a thousand live tasks in it. In addition [to the testing], many ideas were born in the beta tester’s forum, and I thank all these people for their ideas, help and support. What is the team working on now? First of all, we have a new version for Android smartphones and tablets. The development is in full swing! For various reasons, the development of this version moved more slowly than some would like. So, I want to thank all of my customers for their patience. I like what we have done so far and the beta testers have now got the new version for testing. Andrey, you've been working on the MLO for a while. Where do you get the strength and the desire to constantly develop the application? I have a secret source of inspiration. It’s the moment when I suddenly receive an email or read a review from one of the clients, which says simply: "Guys, thank you for what you do. I have been using MLO for a few months now and my life is now organized, you helped me a lot”. Then I know that somewhere on Earth there is at least one person who liked the product so much that they've even sent me a note about it. From these reviews I draw energy, because I understand that my work improves the lives of others. If I get a note like that in the morning, I can do a lot more during a day than usual. I would like to thank everyone, who remembers to send us a note about their feelings and wishes related to MLO - you charge the whole team with positive emotions, thanks to this we are working at our best! P.S. : The MyLifeOrganized team happily joins Andrey Tkachuk in gratitude to all the customers for simply being with us. You are also welcome to share your comments about this article with other users on the MLO user forum. When EccoPro closed down in the late-1990s, I searched for a perfect replacement. After many frustrating experienced multiple apps, I discovered MLO in 2012. I wasn't really sure if it was "The One" until last last year when my business expanded and I progressed from just using the simple outlining functionality to using the MLO's "Projects" frame work. Now, juggling multiple projects, I finally see that MLO blows everything else away in Windows. I think the IOS version needs to be made less awkward and clunky, however. So in IOS, I use ToDo Cloud for my personal ToDo lists. But my main workhorse for running my business is MLO. Hi Bob and thank you for the opportunity you gave to MLO for running your business. Mentioning iOS version are you talking about MLO-iOS v2 or v1? I do think that v1 was awkward. With v2 however I do think it is great. I have just totally reworked my personal task management system and my primary tool now is MLO-iPhone v2 + MLO-Windows. Bob, I am very much interested in your ideas on how we could improve MLO-iPhone v2. Could you please drop me an email with your ideas. We may even discuss it together with our beta team. What do you think on this? Hi Andrey, what's your email address? BTW...by actual name is Eddie Kwong, but for some reason I chose anonymous name when I set this identify up. BTW...Andrey looks a lot like a young Steve Jobs, doesn't he? Of course you DO need. The only competition MLO can get on Mac is Things - the most popular personal manager for the crowd and this app is beatable if you compare it to MLO features. Just stop asking your current AUDIENCE about it. It's a new market and NOBODY here can actually tell you how much money you DO lose everyday by not porting your software on this platform. I'd have done it already many years ago if I were you. I remember the time I was using MLO back in late 2000s. Looks like there is no any hope to use it again in the foreseeable future. Also can you please add some FB authentication to this blog? Bob Wilder - I was also an EccoPro user! I've used MLO for many years . . . started back on my Palm Pilot! I'm looking forward to the new Android update! Are you developing a Mac version? And if so when will we see it? Hello, Peter! We are considering about MLO version for Mac, but we haven't made the decision yet. MLO took windows by storm. it is so close to a project management plan without being a gantt. Android version allows multiple subtasksing, which only todoist which i am using is able to do as well. the reason for me not going to MLO is the high cost on multiple platform and the clunky android interface. Please start developing MLO for MAC!!! With team work feature! It with work complimentary with iOS users. Long time MLO user here. LOVE it. It has been a key component of my routine and the only other tool - along with MindManager - that I can't live without. Now, PLEASE, a Mac version... My new employer has standardized on Mac for my team and MLO is one of the few things running on a Windows VM. Would love to have a native Mac version.